Spring is in the air – though if you’re from our hometown it’s arguably been in the air since January – and what better season is there for a fresh start? As we often advocate with our clients, a periodic review of your research, evaluation, or strategic plans can help keep them relevant and maximize the benefits gained. Customer feedback, whether from a formal voice of the customer program or through informal feedback, is one area we have seen that can grow stale without regular attention. Make the most of the data you have. Look at your current results differently, perhaps by analyzing new segments or trend data. Link up multiple data sources. Link up customer feedback to actual behavior via account data. Capturing actual behavior is always better than asking the customer about it. Similarly, consider outside data sources that can be overlaid on your customer feedback, such as economic information or even weather (weather, for instance, can be a big driver in retail sales). Add fresh questions. New questions can lead to fresh insights. Update your survey questions based on previous findings – what else do you want to learn? Conduct a driver analysis. We often capture feedback on many attributes, but which ones actually matter? Follow-up directly. In our world of collecting and reporting on customer satisfaction we often focus on metrics and big picture areas that need attention. However, don’t forget that sometimes the best thing you can do is to reach out to your customers personally. You’ll need to be up front with them as to whether their feedback is anonymous or not (otherwise you may have an even more upset customer). Some issues are very specific to the individual and can only be addressed one-on-one. Create a system that can identify and route these customers to the right contact for personal attention. (In fact, with hotels, a recent study found that responding to online reviews boosted their bottom line). It takes work, but at least it’s not cleaning out the garage. 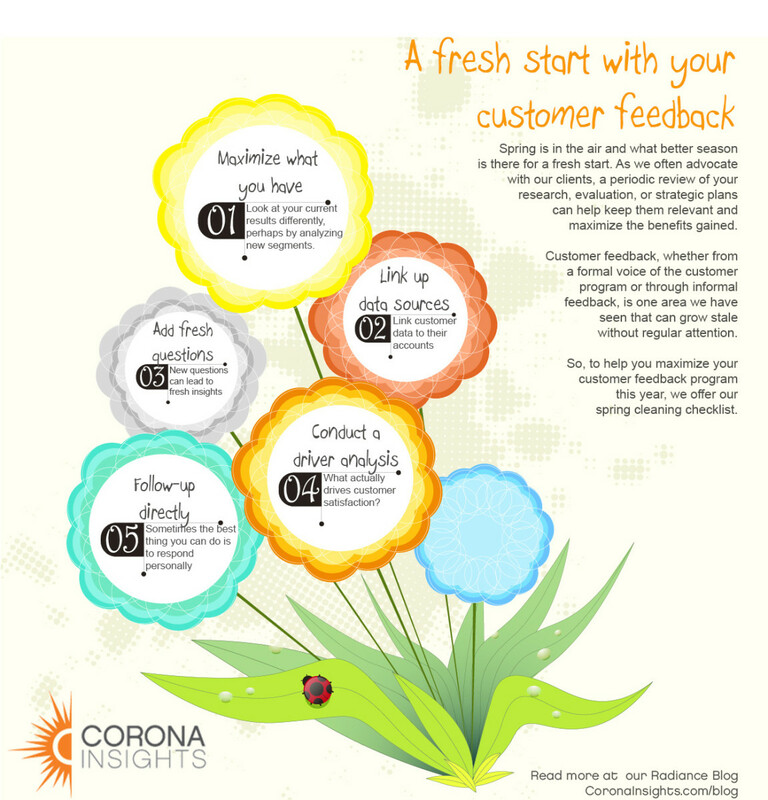 Be sure to check out our previous posts as well on 4 ways to summarize customer feedback results and the different types of customer satisfaction surveys.